The settings in the Export tab control whether notes export , their templates and the export location. All are selection-scope except 'Export to' that applies to all notes in the document. Export. Controls whether the current note is exported when a file level 'Export as HTML…' operation is invoked. If this box is checked, this note will be exported to HTML when you export the document. Having this box ticked is equivalent to setting the $HTMLDontExport attribute to false. Export Children. Controls whether the current note's children are exported when a file level 'Export as HTML…' operation is invoked. If this box is checked, this note's children will be exported to HTML when you export the document. This box being ticked is equivalent to setting $HTMLExportChildren to true. Markup Text. 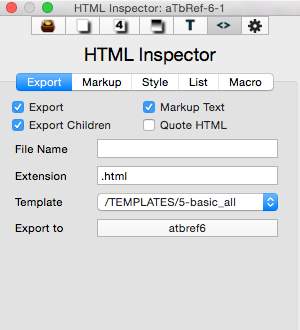 If this box is checked, Tinderbox’s export to HTML attempts to translate text styles, such as italics, boldface, and relative size, as well as elements that look like headings or lists, to similar text styles using HTML mark-up. If this box is unchecked, Tinderbox exports the text of the note without any added HTML mark-up codes. This box being ticked is equivalent to setting $HTMLMarkupText to true. Quote HTML. If ticked, any HTML markup detected in the note is converted to HTML entities on export so it is seen on screen as code instead of being rendered as HTML code. This box being ticked is equivalent to setting the $HTMLQuoteHTML attribute to true. File Name. When Tinderbox exports a note to HTML, it automatically generates a name for the HTML file base on the note’s title. If you want a note’s file to have a specific name—so that you can know what name to link to from another web site, for instance—enter a name here. An entry here is equivalent to setting an $HTMLExportFileName attribute value; if no name is pre-set, the name is generated on the fly when exporting, based on the note name, $HTMLFileNameLowerCase, $HTMLFileNameMaxLength and $HTMLExportExtension attribute settings (if not modified on the HTML view itself). Extension. The file extension suffix that should be added to the filename for the HTML file - default is normally '.html'. Setting a non-default value is equivalent to setting the $HTMLExportExtension attribute. Note the value should include a period as the first character. Template. The Template pop-up list shows the available templates within the document. The default is 'none' but as soon as a single template is added, thus becomes the default. The chosen value is stored in $HTMLExportTemplate. Export to. This opens a folder chooser dialog and allow the export folder to be used when exporting the whole document.